For social marketers, it is very important to know about each single topic which can improve their marketing skills. Especially if you're a newbie to this field. Many people have asked me about the tricks to increase Facebook posts organic traffic. Well there are both non-ethical and ethical ways available. Non-ethical ways will help you very less and chances are, your account will be banned. On the other hand, ethical ways alone can boost up your Facebook post organic reach by 40% least and if you know the correct way, you can target it more. Before understanding this deeply, you should know about the strategies which Facebook uses to arrange/manage posts in news feed. This includes a type of post, use of hashtags, user engagement, content summary, timings and few other factors. In my upcoming tutorials, I will discuss on all these things but as for now, I am going to share my own case study on timings only. Now let me ask you one simple question. Do you think that organic reach depends on timings? If yes, then tell me why do you think so and if not then too tell me about your views in below comment box. 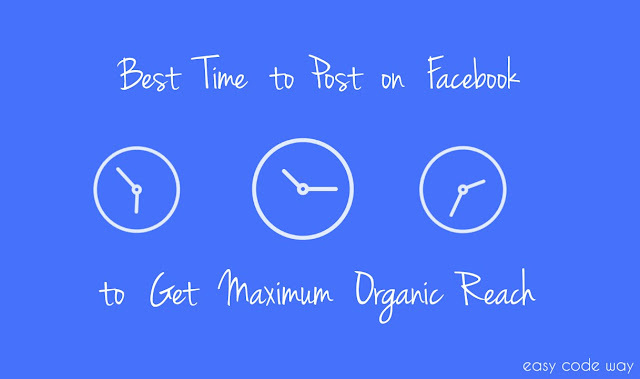 According to me, timings plays an important role for Facebook post organic reach. Organic here means the non-paid traffic. Now the question arises that how is it possible? To explain this deeply, let's have a look at below case study. How Timings Affect Post Organic Reach? From last 2 weeks, I was experimenting on the changes of post timings. I have founded that in some time periods, posts are performing very well while in others, they are very badly affected. Below is what I had experimented. For this experiment, I had used one of my old page which is related to computer/technology category and it has around 12k+ likes. One more important thing is that, most of the people who have liked this page are from Indian and Pakistan country. First of all, I shared all images content in morning time between 6 AM - 12 PM. In next few days, I changed the time period between 12 PM - 6 PM and again between 6PM - 12AM and finally between 12AM to 6PM. Out of all these time period, third one played very well. I mean very very well. Second position goes to 2nd time period and third to 1st one. Remaining is 12AM - 6PM which is at last position. Now if I changed the content type from image to status than position remained same but the organic reach decreases. Finally I replaced it with link and again its audience is dropped. Evening and early night time have comparatively good organic reach. In some cases, morning posts also performed very well. Images are given first priority in news feed and due to this reason, their organic reach is more than any other post type including videos (expect viral video). What is the Perfect Time to Post on Facebook? Now you may ask me that what is the perfect time to post on Facebook so as to get maximum likes? To clearly define this, you should know the reasons why particular time period is standing high in performance. As already mentioned, the targeted geographical location in above experiment is mainly Indian. Here most of the people are free in evening and night so they use social media sites in that free time while in other time period, people are busy in their office or school work. It simply means that you should know the time period in which most of the people are active or online. This may vary from country to country, page category, type of people you are targeting and few other factors. You should do these experiments on your page too and after that conclude the best timings for your page/profile. In my case, morning (between 6AM - 8AM), evening (4PM - 6PM) and night (7PM - 10PM) posting gives me maximum organic reach. This may also work for you. The only key points you should keep in mind before posting anything is that, post must contain relevant hashtags, it should have one image, give a short summary of what you're sharing, add links in it (if possible) and last but not least, schedule it in best time period. Definitely all these little things will improve your Facebook post organic traffic and thus you'll get more likes, comments and shares. Now what are you waiting for? Go and try these amazing tricks. If you have any questions, please ask me in below comment box. What other factors did you find which can improve Facebook post performance?